I am in the process of building some mobile apps for one of my clients, and while I'm pretty familiar with running the iPhone simulator and building iPhone apps, I'm pretty new to the Android development tools at this point. So I thought I would give a quick and easy guide for folks to follow, that might be interested in getting started with Android Development and running the Android Emulator. I should mention that there is also an Eclipse Plugin for Android Development as well that you can use instead. Also, I'm using a Mac, but I think the steps should be pretty close if you are running Windows or Linux. Download the Android SDK, and unzip it somewhere. 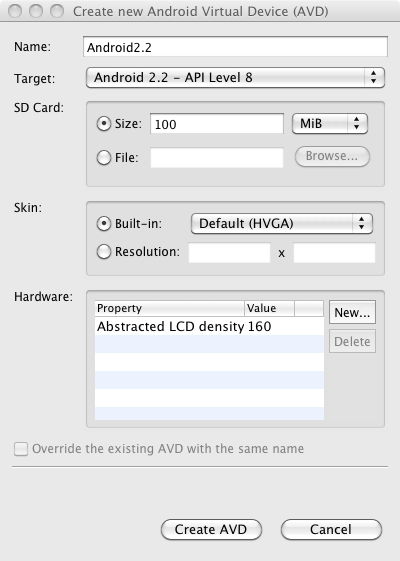 I placed the android-sdk-mac_86 folder in my /Applications/ folder, but you can put it wherever you want. Since we are using the command line you might find it useful to add the android-sdk-platform/tools folder to your system path so you can run the android commands from any folder. If your interested in doing that, Google provides instructions here. At this point, I tried running the emulator command, but the SDK doesn't contain any Android Platforms, the Android platform is essentially Android OS, you need to install at least one version (eg 1.6, 2.1, 2.2, etc) to run the emulator. To install platforms run the android command located in the tools folder of the SDK (use Terminal.app on a Mac, or the Command Prompt on Windows, Linux folks you know what to do :). This will pop up a window. Select Available Packages, pick some platform versions and install. 11 people found this page useful, what do you think? and I cannot read this on the Android Development Site, why? @AAP The Android site does provide useful and very detailed documentation. I am not trying to replace their documentation here, rather I'm trying to illustrate how to get up and running quickly. 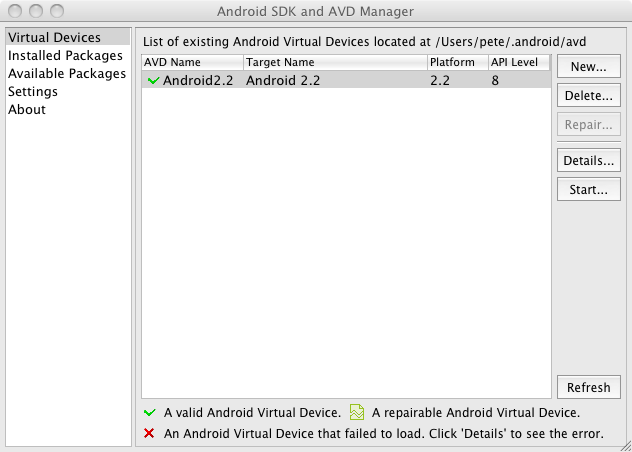 When I first installed Android SDK on Windows it refused to work and no meaningful error message was displayed. Resorting to tools like SysInternals ProcMon I was able to figure out Android SDK depended on Java. 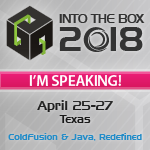 I had Java JRE, but its path was not set on the PATH environment variable. So if you happen to see similar behaviour when you first install Android SDK, check Java JRE/JDK is installed and the directory it was installed in is included on the PATH environment variable. Nice dispatch and this enter helped me alot in my college assignement. Say thank you you as your information. It just keeps says Android_ how can i load an apk file? Hint: use '@foo' to launch a virtual device named 'foo'. please use -help for more information"
If you get the error "invalid command-line parameter: Files. Hint: use '@foo' to launch a virtual device named 'foo'. please use -help for more information"
What you need to do is move your SDK to a folder without spaces to the path.. so.. c:\android-sdk would work.. I can run Android Emulator and see my device inside, I also can add/install some apps. but how can I find the apps I have added in the emulator, are they in .apk files ? I need to transfer them to my MID/Tablet for installation. Tks. i was installed eclipse and sdk ,but i don't where could i find android emulator !! please !! help me!! I created an android emulator and when click contact image, i got "force to close" message. I need add contact...Please help me... Any idea..!!! emulator: WARNING: Could not initialize OpenglES emulation, using software renderer.